Twitter is well known for testing out new features for its service, whether that’s replacing stars with hearts, showing you tweets from accounts that your friends follow or turning favorites into retweets. Now, however, it looks like its ramping up the experimental side of things ahead of Christmas with a way to easily share personalized festive messages through the account @CrimboStory. I’ll stress here, there’s no indication that this is a an official Twitter experiment, aside of the fact that the account’s followers are almost exclusively Twitter employees, which is a pretty big hint. There’s also the tweet below from Twitter employee Kay Dekker, which suggests that all the photos are being taken from inside Twitter’s London office. 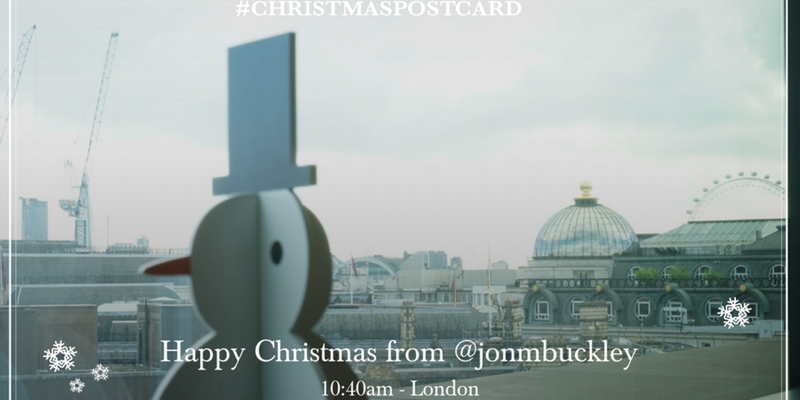 From the look of it, the account sends back a photo taken in London (it currently appears to be either a vantage point looking across the city or the inside of a meeting room) with a personalized Christmas greeting. The idea seems to be that you then share that ‘card’ with friends and family. Whether it will be run as a Twitter-branded tool, or sold off to other brands to generate income remains to be seen, but one way or another, Twitter is cooking up something for Christmas. We’ve asked Twitter for more information and will update if we hear back.